050. 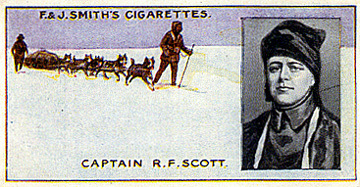 CAPTAIN R. F. SCOTT. ISSUED BY F & J SMITH'S CIGARETTES. (1911). Card number 9 from a set of 50 entitled "Famous Explorers." Size: Ca, 2.65" x 1.42". Recto: Portrait of Scott on right in polar clothing; dog team with two men on left. Upper left: F. & J. SMITH'S CIGARETTES. Lower right: CAPTAIN R. F. SCOTT.